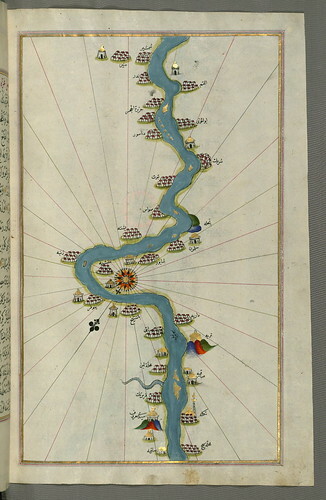 Illuminated Manuscript, Map of the Nile River with various oases on each as far as Sīdī Maʿrūf from Book on Navigation, Walters Art Museum Ms. W.658, fol.310b, originally uploaded by Walters Art Museum Illuminated Manuscripts. Originally composed in 932 AH / 1525 CE and dedicated to Sultan Süleyman I ("The Magnificent"), this great work by Piri Reis (d. 962 AH / 1555 CE) on navigation was later revised and expanded. The present manuscript, made mostly in the late 11th AH / 17th CE century, is based on the later expanded version with some 240 exquisitely executed maps and portolan charts. They include a world map (fol.41a) with the outline of the Americas, as well as coastlines (bays, capes, peninsulas), islands, mountains and cities of the Mediterranean basin and the Black Sea. The work starts with the description of the coastline of Anatolia and the islands of the Aegean Sea, the Peloponnese peninsula and eastern and western coasts of the Adriatic Sea. It then proceeds to describe the western shores of Italy, southern France, Spain, North Africa, Palestine, Israel, Lebanon, Syria, western Anatolia, various islands north of Crete, Sea of Marmara, Bosporus and the Black Sea. It ends with a map of the shores of the the Caspian Sea (fol.374a). Good to play nba games from the mentioned website, These are available for free moreover get free locker codes and badges and gtr access to unlimited VC for nba games. Secure way to play games online by hacking them with ease with the help of http://2kvccodes.com . Get hack for nba game and grab all of them for free. Its real , excess it yourself and explore. Thanks.